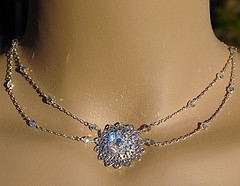 Would like a pattern to make a flower from Swarovski crystals.? I need instructions on how to make a flower using 4 Swarovski hearts and 4 small bicones. The hearts become the petals and the bicones are the center. String the 4 bicones on beading thread or wire and go back through the first bead or two to form a circle. Then put on on of the hearts so that the point is in between 2 bicones, string through the next bicone, put on another heart, go through the next bicone and continue until you’ve used all the beads. Tie a knot. This entry was posted in Crystal Glitz and tagged crystal, earrings,, jewelry, swarovski on August 20, 2009 by admin.